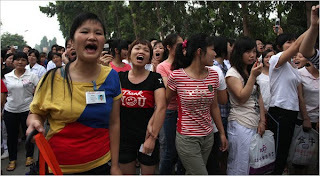 ZHONGSHAN, China — Striking workers at a Honda auto parts plant here are demanding the right to form their own labor union, something officially forbidden in China, and held a protest march Friday morning. 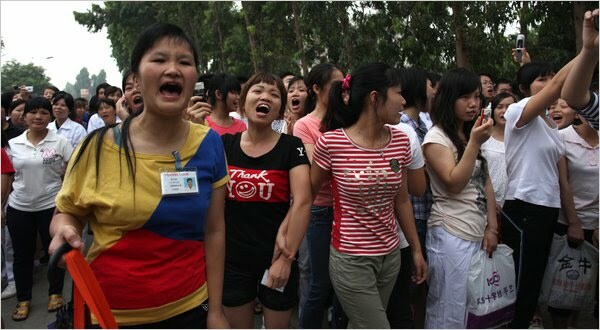 Meanwhile, other scattered strikes have begun to ripple into Chinese provinces previously untouched by the labor unrest. A near doubling of wages is the primary goal of the approximately 1,700 Honda workers on strike here in this southeastern China city, at the third Honda auto parts factory to face a work stoppage in the last two weeks. The productivity miracle is just overworked and underpaid workers across the globe. Unless of course, you work for Uncle Sam, where you don't have to work and you get overpaid!! It costs about $12 more per hour to employ a state or local government worker versus a private sector employee, the Labor Department said Wednesday. Employers spent $39.81 per hour worked for state and local government workers in the first quarter compared to $27.73 per hour for those with private industry jobs. The numbers are part of the Labor Department’s quarterly series on employer costs for employee compensation and they wrap in wages and salaries as well as health benefits such as health insurance and retirement packages. The disparity between civil (read: silly) servants and private sector compensation in Canada is even more absurd. Seems to be a common problem everywhere!